It is no wonder many people think corned beef and pastrami are the same. Aside from having that salty flavor, both involve curing and they look similar as well. Are they the same? They have many similarities. However, they are completely different when it comes to preparation, meat cut, and even how and when they are eaten (at least, to some). These differences will be discussed in this article. Corned beef got its name from the rock salt or “corns” of salt used to cure the meat. The preparation involves salt-curing a brisket or beef round primal cut with rock salt and curing salt (Prague powder). Spices and sugar may also be added to the brine bath before the meat is slowly simmered or boiled. The process of salt-curing causes the meat to turn gray, but the curing salt or Prague powder, which contains nitrite, gives the meat a pink hue. Corned beef is popular as the main ingredient in corned beef hash recipes and is usually eaten on a reuben. 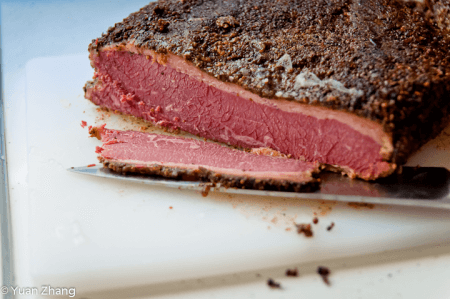 Pastrami is a piece of meat typically a cut from beef that is cooked by smoking. Before cooking, however, the meat is soaked in a brine solution and then later left to dry. The next step is coating the meat with flavorings like herbs and spices before it is finally smoked and steamed. Originally, beef plate is used for making pastrami. These days, however, pastrami made from beef navel, beef brisket, beef round and even salmon, tuna and turkey. It is best eaten on a rye or deli sandwich. What, then, is the difference between corned beef and pastrami? When it comes to preparation, both corned beef and pastrami are soaked in a salt bath that contains herbs and spices before cooking. Corned beef is cooked by slowly boiling the meat in a brine solution, while pastrami is cooked by soaking the meat in brine, drying it, and then smoking it after. Although it was originally made from beef plates, pastrami is made from beef navel, beef brisket, or beef round. 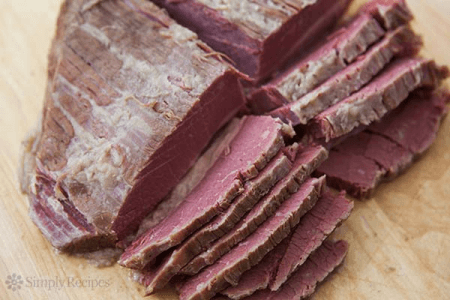 Corned beef can be made from beef round or brisket. Additionally, pastrami has non-beef variations. Salmon pastrami, tuna pastrami and turkey pastrami are common nowadays. On the other hand, corned beef can be only be made from beef. Pastrami is widely eaten with a freshly baked rye bread, while corned beef is best eaten on a reuben. Corned beef is also paired with chips and pickles, and is the main ingredient in corned beef hash recipes.